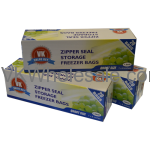 We carry different kinds of food storage bags for dollar stores. Our collection includes zipper seal bags for dollar stores, ziplock bags for dollar stores, sandwich bags for dollar stores and many similar products. 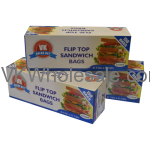 We carry food storage bags in different sizes. 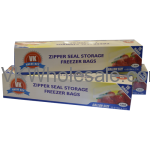 Minimum quantity for "Zipper Seal Storage Freezer Bags Quart Size 20CT" is 24. 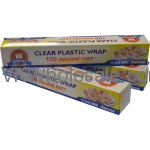 Minimum quantity for "Clear Plastic Wrap 100 Sqft" is 24. 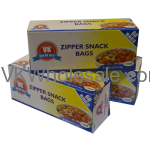 Minimum quantity for "Zipper Seal Snack Bag 60CT" is 24. Minimum quantity for "Zipper Seal Storage Bags 1 Gallon Size, 15CT" is 24. 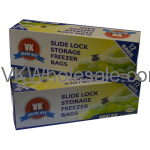 Minimum quantity for "Slide Lock Storage Freezer Bags Quart Size 12CT" is 24. Minimum quantity for "Sandwich Bags Flip Top 150ct" is 24. 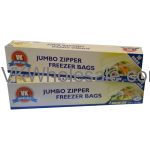 Minimum quantity for "Jumbo Zipper Freezer Bags 2 Gallon Size, 10CT" is 24.